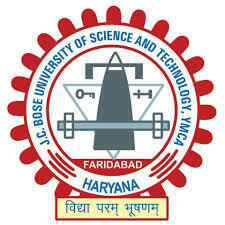 Chandigarh, 21 September – J.C. Bose (erstwhile YMCA) University of Science and Technology, YMCA Faridabad, has signed a memorandum of understanding (MoU) with the Information and Communication Technology Academy of Tamil Nadu (ICTACT) to conduct training programmes for faculty and students which will also facilitate the placement of the students. The MoU was signed by Dr. Vikram Singh, Dean (Academics Affairs) on behalf of the J.C. Bose University, in the presence of Vice Chancellor Prof. Dinesh Kumar, whereas Regional Head, North India of ICTACT Mr. Raghavan Srinivasan, signed the MoU on behalf of ICTACT. Director, Industry Relations, Dr. Rashmi Popli, Coordinator, Ms. Rashmi Aggarwal and, Senior Manager and Relationship Manager of ICT Academy of Tamil Nadu, Mr. Anand Babu and Mr. Lovetesh Kumar were also present on this occasion. Speaking on this occasion, Vice Chancellor, Prof. Dinesh Kumar said that as ICT is the backbone of technology and innovations and this partnership would benefit those faculty and students of the University who are using ICT as their core subjects. Further, it would also bridge the gap between industry and academia, thereby increasing employability of the students, he added. Senior Manager of ICT Academy of Tamil Nadu, Mr. Anand Babu said that with training of teachers and students as the primary objective, ICTACT had been working through a seven pillar program in the areas of Faculty Development, Student Skill Development, Entrepreneurship Development, Youth Empowerment, Industry-Institute Interaction, Digital Empowerment and Research and Publications. That way, this partnership is both transformative as well as value adding, he added.